How cool is this type of fishing?.... 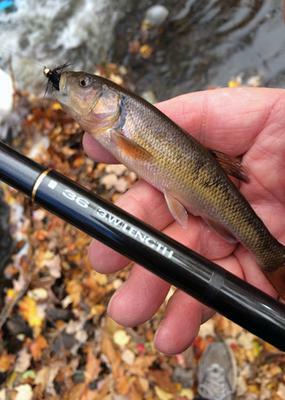 During the spring a group of outdoor enthusiasts got together at Hacklebarney State Park in western New Jersey to sample Tenkara fishing. Pastor Chris Scriven, of Chester NJ was kind enough to let me try his rig and I was hooked (no pun intended). Since then I’ve had Tenkara on my mind. I just love the simplistic approach to fly fishing, much like shooting traditional archery, which I also do. About 3 weeks ago I purchased a Tenkara rig from Chris Stewart. Prior to meeting with Chris, I think I read all 760 pages on his website and just about anything I could l find on Tenkara and watched lots of You Tube videos. Since I was going to be in NYC for the day, I got to meet with Chris and home I went with my Suntech GM Suikei Keiryu Special 39 and a bunch of line, and other doo-dads. Why the Suntech GM 39? I wanted an all around rod, that I could fish dry flies, wet flies, nymphs etc. The rod is a three-length rod, going from 10’4”, 11’8” and 12’10”. Some may disagree with this approach, but it works for me and I’m a happy camper. I fish small streams, lakes, rivers, ponds, you name it. I have a small stream by my house, that I’ve always wanted to fish and in fact I ride my mountain bike there. I made up some lines and off I went. Now I don’t have a lot of flies yet, but I had a couple and one in particular worked, a wet fly and I don’t know the name of it. Very nice fish! Tenkara is a way of returning that childhood thrill of fishing and the countless days of learning about the tackle, fish and outdoors. With tenkara at 57 years old I have entered my second childhood and don't plan to leave.